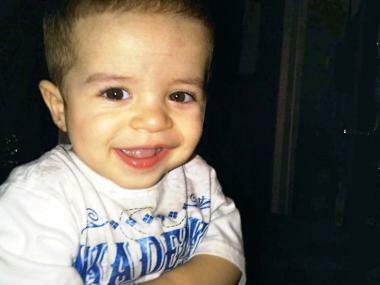 Isaiah Rivera, 3, was shot in the leg at 383 Pulaski St. in Brooklyn on July 8, 2012. BROOKLYN — A 3-year-old boy playing in a Bedford-Stuyvesant park outside the Roosevelt Houses was struck by two stray bullets Sunday afternoon, police said. Isaiah Rivera was playing near an elephant-shaped sprinkler in the playground at 383 Pulaski St. when shots rang out in broad daylight just before 4 p.m., police said. The tyke was hit in the right calf and bullet fragments pierced his left leg, sources said. He was rushed to Kings County Hospital, where he was in stable condition Monday, officials said. Police cordoned off the park while investigators questioned witnesses. Sources said several people were playing a dice game near the park when two gunmen approached the group and opened fire. After spraying the playground with bullets, the suspects hopped into a vehicle and fled. Cops recovered 13 9mm gun shell casings in the park, sources said. A suspect cops believed was involved in the shooting was taken into custody Sunday night, police said. It was unclear, however, if the man was still in custody or if he had been formally arrested, police said Monday.